Beit Surik, is a small Palestinian village 10 kilometers northwest of Jerusalem. It has a population of 3597 inhabitants (472 families) according to PCBS Statistics in 2003. Like many Palestinian villages in the West Bank, Beit Surik residents depends mainly on agricultural productions for their living, as 80% of the inhabitants rely on agriculture as their main source of income. The village lands are planted mainly with olive and apricot trees. The village lands comprise 4238.1 dunums (4.2 km2), while the built-up area constitutes 391.4 dunums (0.4 km2). According to military orders served to residents of Beit Surik by the Israeli occupying forces in October 2004, the Segregation Wall will effectively isolate and appropriate up to 2837.06 dunums (2.8 km2) of the village's lands (67% of the total lands). This massive confiscation promises to severely affect the humanitarian situation in Beit Surik. Today Beit Surik is hemmed in by two illegal Israeli settlements. The settlement of Mevaseret Tsiyon sits on 129.77 Dunums (.013 km2) of Beit Surik lands (confiscated during the 1948 War) to the southeast of the village and the settlement of Giv'at Har-Adar sits on 230.78 dunums (0.23 km2) of Beit Surik lands to the northwest of the village. Reportedly, Israel's settlement master plan for Giv'at Har-Adar also calls for the confiscation of an additional 3,000 dunums (3 km2), in part from Beit Surik land, for the expansion of the settlement (see Photos One and Two). In addition, Israeli occupation authorities declared that construction for a proposed railway will probably run through Beit Surik village lands (south of the built-up area), on its way south to the Mudein settlement block where it will connect to the Jerusalem-Tel-Aviv line (See Table One and Map One). In February 2004, Israeli occupying forces began clearing land for the construction of the Segregation Wall in Beit Surik. Construction in 2004, however, was met by nonviolent protests led by Palestinian villagers from Beit Surik and Israeli activists from Mevaseret Tsiyon who demanded that the Wall not be built between their two communities. The Palestinian villagers and Israeli activists brought the case to the Israeli High Court, which passed an injunction to halt the work. On June 29, 2004, the Israeli High Court issued an order to re-route 30 km of the Wall in the villages located to the northwest of Jerusalem. The section of the Wall that was planned in Beit Surik was highlighted by the court. Israeli military planners were told to adjust the route of the Wall to take into consideration the humanitarian needs of the civilian population, including the villagers of Beit Surik . 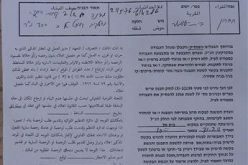 On October 25, 2004, Israeli occupation forces handed Beit Surik two military orders number (04/75/T Judea & Samaria 2004) and (04/76/T Judea & Samaria 2004) calling for the confiscation of 2235.54 dunums (2.2 km2) of village lands for the construction of the Segregation Wall. 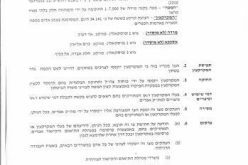 In fact, additional areas will be isolated by the Wall in this location and 2837.06 dunums (2.8 km2) of Beit Surik lands will be isolated, de-facto appropriated, as a result of these orders (see the military orders in Appendix One and Photo Three). ). On February 20, 2005, The Israeli Ministry of Defense issued a finalized plan of the Segregation Wall in the West Bank. 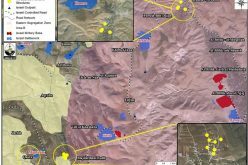 According to this plan, the Wall will confiscate only 1096.28 dunums (1.1 km2) of land in Beit Surik. This route, however, does not correspond to the military orders served to residents of Beit Surik in October 2004. See map of new Wall route.. According to the military orders a total of 2837.06 dunums (2.8 km2) of village lands will be isolated and appropriated by the Segregation Wall (see Map Two). ). 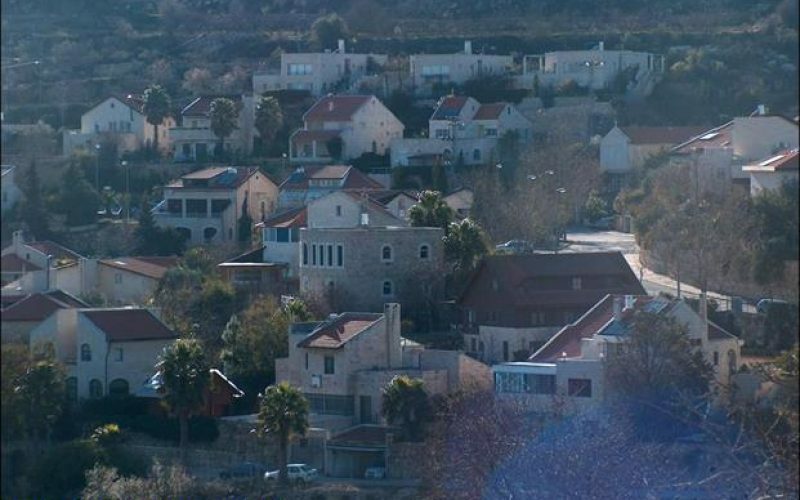 It is note mentioning that the residents of Har Adar have raised a petition to the Israeli high court indicating that the Wall is too close to them and that it should be bordering the Palestinian villages and not them. To view full report, click here..
Israeli occupying forces have carried out widespread destruction of Palestinian agricultural land in Beit Surik since October 2000. In the past four and a half years, 70% of Beit Surik's fruit trees (including more than 2,000 olive trees, 2,500 grapes vines, and 1,000 almond trees) have been uprooted by Israeli occupying forces. 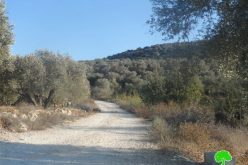 Approximately, 11,000 olive trees are currently threatened to be uprooted by the current construction of the Wall (see Photos Five and Six) and ). In addition, the construction of the Segregation Wall has resulted in the confiscation of 8 wells in the village. The loss of the wells caused vegetable and grain crops to die and a significant amount of last autumn's harvest was lost too. When completed, the Segregation Wall will increase the difficulty of transporting goods and products from fields in Beit Surik to markets in Jerusalem and Ramallah. Approximately 30% of Beit Surik's lands are arable lands, suitable for agriculture (See Table one – ARIJ Database 2005). Urban Fabric (Palestinian Built up area). The Segregation Wall, however, threatens to appropriate more than half these lands (see Table Two). Urban Fabric (Jewish colony and Palestinian Built up area). * This Table was formed on the basis of Israel's finalized plan for the Segregation Wall in the West Bank (released February 20, 2005). It does not consider the lands confiscated as a result of the military orders on October 25, 2004. 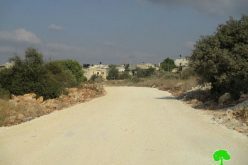 Despite the ruling of the Israeli High Court in June 29, 2004, Israel's new plan for the Segregation Wall in Beit Surik significantly harms the civilian population of the village. If Israel's finalized Wall plan is followed in Beit Surik, the Wall will appropriate 1096.3 dunums (1.1 km2) or 26% of the total village lands. 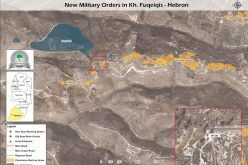 If the Wall is built according to the Military orders of October 2004, the results will be even more drastic as up to 67% of Beit Surik's land will be isolated. In both cases, an exceptionally high percentage of the territory threatened by the Wall is arable land which the residents of Beit Surik depend on for food and cash crops (See Chart One). ). Following Israel's re-imposition of its closure policy in the West Bank, beginning in October 2000, many workers in Beit Surik village lost their jobs inside Israel. As a result, the unemployment rate in the village has reached up to 65%. Many workers also turned to agriculture as a way of maintaining a viable livelihood. 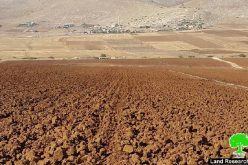 The construction of the Segregation Wall and confiscation of large parts of Beit Surik's agricultural lands, however, significantly harms the ability of families to make a living. The Segregation Wall cuts Beit Surik off from friends and relatives living in nearby villages. The Wall will make it impossible for residents of Beit Surik to travel to Jerusalem and other nearby localities and will extend the travel time to Ramallah, the next closest urban center. The village has no institutions of higher learning and the long traveling times will force university students to leave home in order to attend university. The village also does not have any healthcare facilities. Residents of Beit Surik have traditionally accessed hospitals in Jerusalem. The Segregation Wall makes this journey impossible and residents will be forced to travel long distances to reach the hospital in Ramallah, or elsewhere (for a list of social services and civilian infrastructure in Beit Surik see Appendix Two). Israel's Segregation Wall in Beit Surik represents a humanitarian catastrophe. 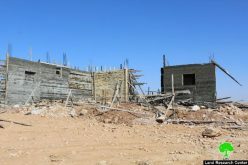 According to military orders served to Beit Surik's residents, the Wall will result in the appropriation of 67% of their village lands. The village will be isolated from most of its agricultural lands which many residents depend on as their only source of income. The path of the Wall also violates the terms of the Israeli High Court decision of June 29, 2004 which ordered Israeli occupation authorities to reroute the Wall around Beit Surik to take the humanitarian needs of the civilian Palestinian population into consideration. The current plan for the Wall, represented in the military orders of October 2004, fails to make this adjustment. The Segregation Wall anchors Israeli military occupation and settlements in the Palestinian territories, in a blatant violation of international law and resolutions, which do not permit annexation of land by force.The Government of Israel continued to follow a policy that aimed at annexing more Palestinian lands in violation of its obligation under the Fourth Geneva Convention and UN resolutions 242 (1967), 446 (1979) and others relating to settlements in the Arab territories occupied since 1967, including Jerusalem. The Wall encircles Palestinian towns and villages forming tiny ethnic ghettos and enforces an apartheid regime in the Occupied Palestinian Territories. The Wall deepens and aggravates the humanitarian crisis in Palestine and destroys hopes for peace and political initiatives. In doing so, it also jeopardizes any chance of long-term security and stability in the Middle East. If the intention of the Segregation Wall is to increase security for Israel, then it should be built on the borders recognized by the international community (June 1967 borders). The Wall, however, is a poorly disguised land grab. On the ground, Israel is illegally confiscating Palestinian lands under security claims. As a result, the Wall violates several United Nations Security Council Resolutions and numerous aspects of international humanitarian law. The Wall also undermines the basis of the Israeli-Palestinian peace negotiations and the Road Map peace plan. Block 5: Kharbet Al Maroon. 2. I announce by that the above mentioned lands are seized for military reasons . 8. The name of this order is: Order to seize lands n0 04/75/T (Judea & Samaria ) 2004.